Young UK rapper Nadia Rose has taken fifth place on the BBC's Sound of 2017 list, which showcases emerging artists for the coming 12 months. Alongside the likes of Little Simz and Lady Leshurr, she's part of a groundswell of female voices in the male-dominated world of UK hip-hop and grime. Two years ago, the 23-year-old was studying for a degree while working 12-hour shifts in a betting shop to make ends meet. She would scribble down lyrics in her spare time as her male contemporaries - Section Boyz, Bonkaz and her cousin Stormzy - were starting to break through. Realising the job was holding her back, she packed it in and started to make her name with her savage, witty lyrics and sense of fun. Her breakthrough video, Station, was shot, without permission, at a local railway station, with Nadia dancing nonchalantly on the tracks as a train pulled in. More recently, the colourful, funky single Skwod saw the rapper take over the streets of London with a girl gang, complete with body-popping Beyonce choreography and all. She spoke to the BBC about her upbringing in Croydon, the rappers she looks up to, and why she read the dictionary as a child. For people who haven't heard you, describe what they're missing. My sound is just really bassy, hard-hitting, dancehall, hip-hop infused fun. I call it magic. And funny, too. Your lyrics have proper punchlines. Do you work hard on them? It varies, depending on what it is I'm creating. A lot of the time I don't even write the bars. It's all in my head, really. Image caption The rapper says her verses are "full of fun, full of energy"
Apparently you used to read the dictionary as a child? Antidisestablishmentarianism. It's one of the longest words in the English language. Have you ever tried to get it into a song? I've been asked and I'm definitely working on it! It might not fit on a single cover, but it could definitely fit in a lyric. What triggered your interest in words? It was learning about synonyms that did it for me. I was like, "Wow, you can use another word to mean the same thing as this word?" It just went crazy from there. When did you first perform in public? Ooh… The first time I performed in public? To be fair, growing up I was always performing. It didn't have to be on a stage. It could be a family event and I would just make it about me, somehow. I would perform anywhere. Going up in a lift, on the side of a road, wherever. One of your teachers said you were the most entertaining pupil she ever had. Yeah, that was touching… And actually, I do agree. There's a fine line between "entertaining" and "troublemaker". How often did you end up on the wrong side? Ha ha! Some days it did tip over into what some teachers would call "disruptive". But I thought it was creative. Music and music management. It was very helpful when signing my deal - because there were things I definitely wouldn't have had a clue about prior to taking that course. At the same time as studying, you were working at a betting shop and making music in your spare time. Did you get any sleep? Nah, barely. All my free time was up in the studio. I just had a feeling I was giving music my spare time, rather than my time. It got to a point where it felt very weird and I thought, "This is all the wrong way round. I'm getting too comfortable at work and keeping music as a little side thing." I needed to give it my all to actually get the results that I wanted. Your dad was an MC too. How instrumental was he in your musical education? He played a huge part in all of this. He had quite an eclectic music taste, but there was loads of Sizzla, Buju Banton, a lot of the old-school reggae guys. That's where that part of my musical personality comes from. Who were the MCs you listened to growing up? In terms of MCs and rappers, it was definitely a lot of the hip-hop legends, like Busta, Eminem, Missy, Lil Kim. But I wasn't just inspired by MCs. I was a huge Spice Girls fan, too. There weren't many female MCs in the UK to look up to. Well, there was Ms Dynamite. Seeing what she was able to achieve was inspiring. How do you feel about the current wave of female MCs? It's a good time and hopefully it'll continue to build. Probably me! I bringing them with me! I saw a freestyle you recorded for SB:TV where you said you'd been told to "get naked and wear thongs" to sell records. Was that based on real experience? It's from personal experience as well as people that have told me stories. As women in this male-dominated field, we've all been approached with something along those lines at one point. It happens, but we have to be able to overcome it. I need to ask about the video to Station... I was worried you might die on the train tracks. A few people were, including my mum. It was literally by chance that we survived. There was no real planning. We didn't even get permission. Recently I found out we got the train times wrong. The train that would have been coming on the other side was actually due at the time we got off the tracks… We thought we had a good five minutes spare, but we had seconds. 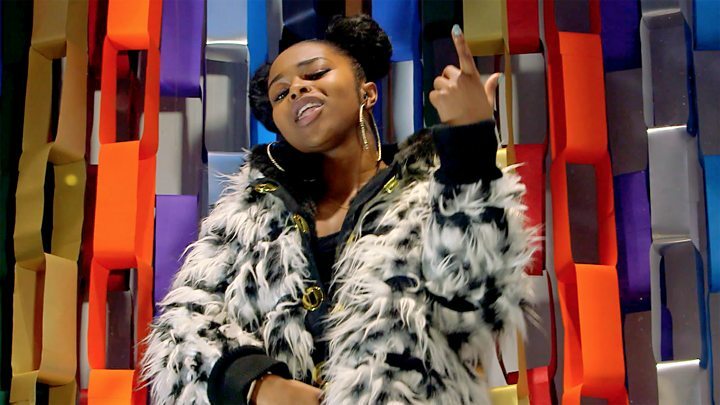 Network Rail has asked the BBC to point out that, while they applaud Nadia Rose on her success, they were concerned to see her music video set on the working railway. A spokesperson said: "Trespassing on the railway is highly dangerous and can maim or kill you. As the operator of the railway, Network Rail has a responsibility for keeping passengers and visitors safe and we take these responsibilities very seriously. No one wants to stop people from having innocent fun but they should do so safely without putting their lives at risk." The other notable thing about that video, and Skwod too, is how much charisma you have. Were you always a natural in front of the camera? Yeah, basically. I'm in my element. I'm doing the thing I love and I'm being able to share that with people. Image caption Nadia Rose: "I definitely need a Grammy under my belt"
This summer, you got to go to Rio for a grime showcase at the British embassy. What was that like? That was amazing. I loved Rio. Just to be part of the Olympics was extra-special, again with my squad. I look forward to going again. Well, I'm actually a huge Sting fan. I wouldn't call him boring, but I get what you mean. It was definitely good to bring my sound over there. So what's your plan for 2017? It's going to be filled with a lot of music, a lot of visuals. If you thought this year was the Nadia Rose takeover, you have no idea! I definitely need a Grammy under me belt. One at least. At the very least. To bring a Grammy back to Croydon, how would that be, eh? Nadia Rose's debut album Highly Flammable is released on 13 January by Sony/Relentless Records.